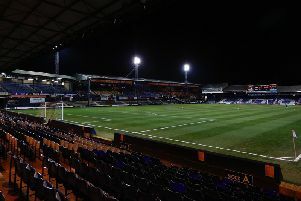 Town’s gut-wrenching play-off semi-final defeat at the hands of Blackpool last season was the principle driving force behind the Hatters’ quest for promotion this season according to striker Danny Hylton. It was Hylton who cut a forlorn figure when addressing the press after that cruel night at Kenilworth Road back in May 2017, when a stoppage time goal saw the Tangerines draw 3-3, going through 6-5 on aggregate. The gaffer’s used that at every opportunity he can to spur us on and lift us and loads have reacted and we’ve gone one better this year. Fast-forward a year and this time there were no tears, with Luton up at the first time of asking, finishing as runners-up to Accrington Stanley, but Hylton was quick point out what how big a role that loss had played. He said: “It drove us, every single week, every single training session, every single day, it drove us on as we were so low after that and it was the worst feeling I’ve ever felt in my life. “To concede in the 90 whatever minute to lose the game was terrible. “The gaffer’s used that at every opportunity he can to spur us on and lift us and loads have reacted and we’ve gone one better this year. Hylton had won promotion once in his career before, when at Oxford United they also finished second in the table back in the 2015-2016 season, although he felt doing it with Luton was an even greater achievement. He continued: “It gets better every time, as it was fantastic when we did it on the last day of the season at Oxford. “Of course it was a great day, but there was probably even more expectation on us this year at Luton to do it as everyone expected promotion. Hylton once again had a terrific season for the Hatters, finishing top of the scoring charts with 23 goals from 43 appearances and also named in the EFL and PFA Teams of the Season. Reflecting on his own campaign, the striker added: “Of course, again, I’m delighted, EFL, PFA, top scorer too. “It doesn’t matter who finishes top scorer though, he’s (James Collins) been fantastic this season, but it’s not about me or him, or Elliot Lee, or anyone. “It’s about a collective group and a group of 25, 30 players, achieving and achieving what we set out to do.